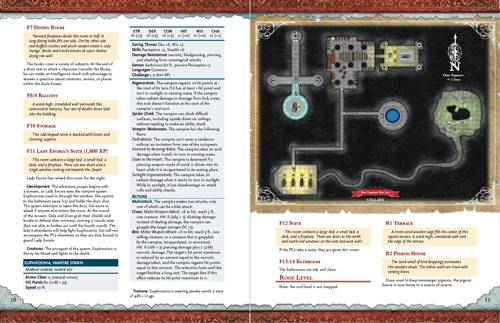 Over a century after adventurers defeated the Red Vampire, the manor house from which the undead count reigned has become an inn and tourist attraction. A welcome relief for weary travelers, the Red Vampire’s Way Inn provides soft beds and warm meals in the otherwise inhospitable Eerie Forest. Yet beneath the inn, the Red Vampire’s legacy is not destroyed, but only contained. Tonight an inquisitive guest will break the seal. It’s up to the PCs to defend the other guests and themselves from the horrors that are released. Can they survive One Night at the Red Vampire? 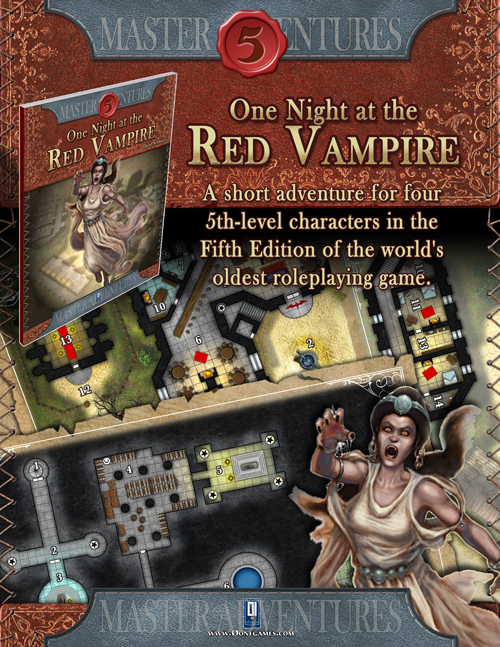 The events of One Night at the Red Vampire occur at the Red Vampire’s Way Inn. In the Eerie Forest, the inn is situated where the Road of the Two Fangs meets the Road of the Walking Dead. GMs are encouraged to place the Inn on whatever stretch of lonely road is convenient for their campaign. This short adventure is designed for four 5th-level characters in the Fifth Edition of the world’s oldest roleplaying game. There's a lot packed into a few pages here, a nice little ad ..